The bride’s parents Christopher and Denice, along with her sister, Jennifer, Jennifer’s husband, Neil, and their two young daughters, Katie and Grace, got in the limousine that would take them home after a long day of love, laughter and festivities. “I remember looking in on the limo and seeing Kate and waving goodbye and she waved goodbye and never thought that was going to be the type of moment where you’re seeing people for the last time,” says the groom David. The left the wedding in a limousine from Long Island and soon joined the highway. They weren’t to know that a drunk 24-year-old, Martin Heidgen, was also driving at the same time. Heidgen, hit the limo head-on, when driving on the wrong side of the road causing a devastating accident. Martin’s blood alcohol level was more than three times the legal limit according to police reports. He was driving at a speed of 70 miles per hour, he had consumed at least 14 drinks and was on the wrong side of the highway for at least two miles, before the catastrophic event happened. Stanley Rabinowitz, 59, the driver of the limousine, was killed instantly after being crushed by the engine. Christopher, the bride’s father had broke both of his legs in several places after being thrown to the floor. At a later stage he had to have one amputated. 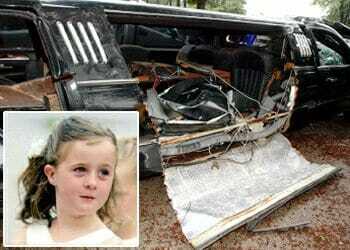 Also seriouly injured was his wife Denice and little grace was stuck in the wreckage. Neil attempted to crawl from the car to seek help, despite having a broken back. In the meantime, Jennifer, who injured her foot, was desperately looking for Katie, at the time of the crash she had been lying beside her on the seat. All of a sudden, Jennifer Flynn saw something that no mother should ever have to witness – Katie, her little girl had been decapitated by her own safety-belt. Michael Tangney, one of the first responders on the scene who was the bride’s uncle and a policeman himself. “I opened the rear door to the limousine and realized it was my family.” he remarks. Unfortunately, the worst was yet to come. 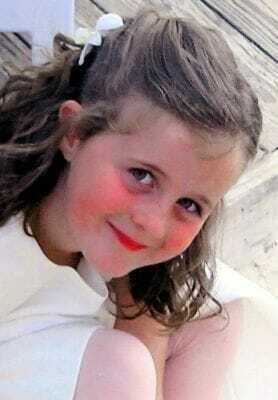 Michael Tagney, would witness Jennifer emerging from the limo with her daughter’s head in her hands. Katie’s body still in the car, wearing the dress she had proudly worn for the wedding only a few hours earlier. Jennifer sat on the roadside for the next while. On her lap she kept hold of Katie’s head, and looked on as the rest of her family were released from the wreckage of the destroyed vehicle. Finally, she knew it was time to let her daughter go; and handed her to Michael. She tenderly kissed her daughter’s face one last time. The lives of the whole family has been shattered by this tragic event. Driver Martin Heidgen, was sentenced to 18 years in prison for two counts of second-degree murder – although no justice will ever ease the pain for Jennifer’s loss of her daughter. Jennifer and Neil have courageously chosen to speak up about their story, in the hope that it might prevent repeat incidents. “Since no one should have to live the life I do, I felt a responsibility, an obligation, to stand up and tell our story,” Jennifer said. “I hope that by experiencing the devastation that we survived that night, and still continue to live through, people can see the seriousness of drunk driving as the crime it really is. Hopefully we will save more in the future.” she adds. Please share this story to help prevent acts like this tragedy occurring in the future. 1 Response to "Drunk driver smashes into wedding car: Police looks into wreckage and see horrific discovery"